There's no better time than now to subscribe to one of our solutions! You'll benefit from all of our new features such as PBR compliance, 3D mesh conversion in standalone clouds, our new procedural vegetation library and more! 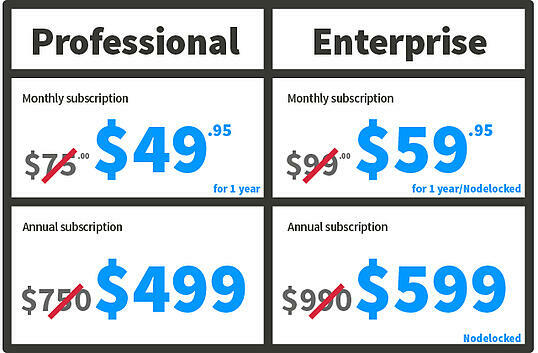 You'll have the chance to subscribe to either our Professional or Enterprise solution at an incredible price! Choose from either a monthly or annual subscription and lock in the prices below for an entire year! If you're ready to create more and spend less, then click below to secure this special offer now! Hurry though, this offer ends March 31st! (1) The Creator Solution is not included in this deal. If you want to upgrade from one Solution to another price you will need to cancel your current subscription in our store and buy a new one. There is no refund or pro rata base calculation. (2) Professional Solution subscription plans are placed under a “no-commitment” policy, meaning that users will have the possibility to cancel and restart their subscription at any time. However, if users cancel their subscription plan at a discounted price, the standard price will be applied next time they buy the subscription. Enterprise Solutions require a one-year minimum commitment policy. (3) Educational licenses are not included in this offer.